Sure, it could easily have been another song in the event but it’s quite a moment when the veteran cast of Seventeen dances to Taylor Swift’s Shake It Off. Famously, it nearly didn’t happen. When rights to the song were denied at the last minute, director Anne-Louise Sarks took to Twitter. The campaign went viral with Swift tweeting her permission, gifting the production invaluable publicity. 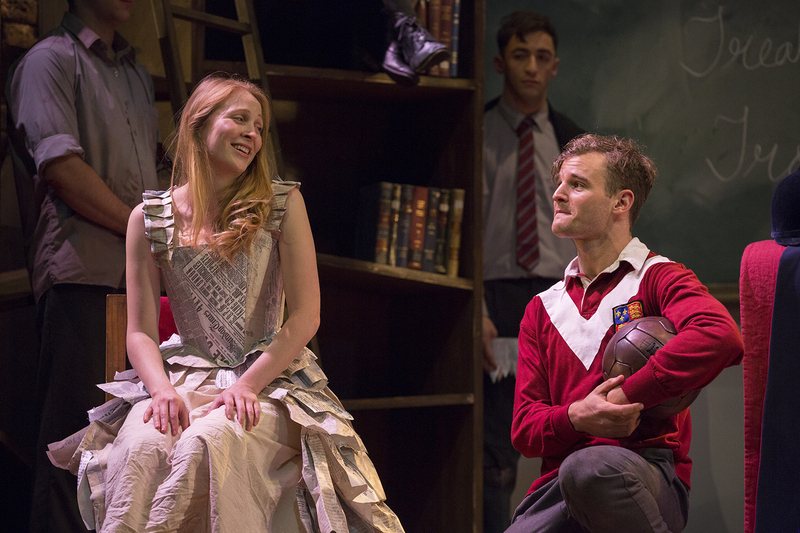 Written by Matthew Whittet, Seventeen is a very sweet play. On the last day of high school, a small group of friends gather in the park to party the night away before they all go their separate ways and life changes forever. As they drink too much, dance and play truth and dare, anxieties, fears and secrets bubble to the surface. It could be performed by young people but Whittet wrote it for 70-year olds, adding another level of poignancy to his examination of those uncertain years on the cusp of adulthood when you ponder who you are and what you hope to become. And so we have a cast of esteemed older actors in the roles. 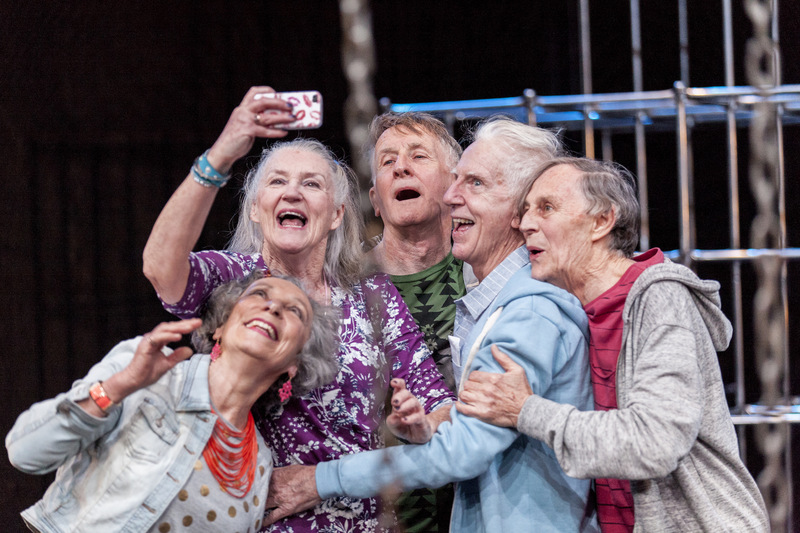 There’s the loud, pushy ringleader Mike (John Gaden), his quieter, more sensitive best mate Tom (Peter Carroll) who is heading interstate to Melbourne University, Mike’s pretty, popular girlfriend Sue (Maggie Dence) and Sue’s brainy friend Edwina (Anna Volska) who rarely lets her hair down. Joining them are the uninvited Ronny (Barry Otto), the weird, misfit kid that no-one likes, and Mike’s 14-year old sister Lizzy (played by the younger Genevieve Lemon) who won’t go home no matter how much they tell her to piss off. The company spent time during rehearsals with some 17-year olds to get back in touch with a teenager’s energy, physicality and way of talking – and they all do a great job. Carroll and Gaden, in particular, climb the playground equipment and get their groove on with the ease and exuberance of people decades younger (movement by Scott Witt). 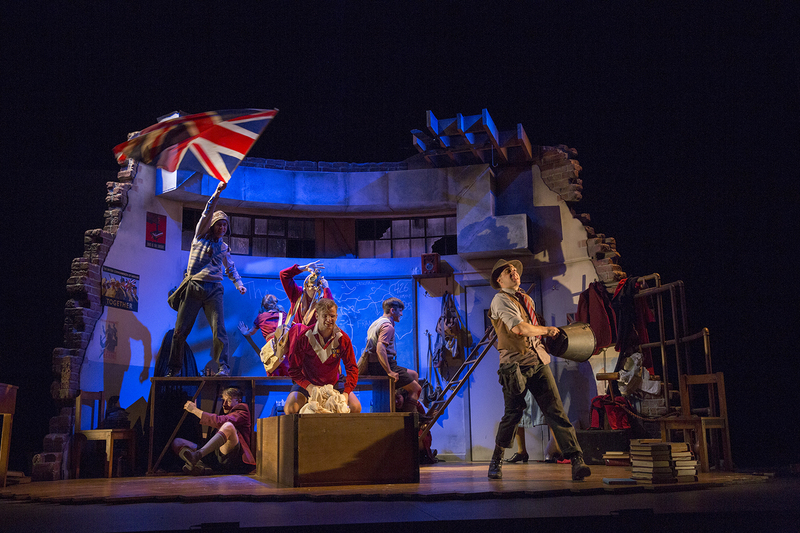 There are a few clunky moments as Whittet sends characters off stage to allow others to remain alone, which feel a bit engineered, but overall Sarks’ production is nicely staged on Robert Cousins’ playground set, with very clever costuming by Mel Page. The performances are exceptional. 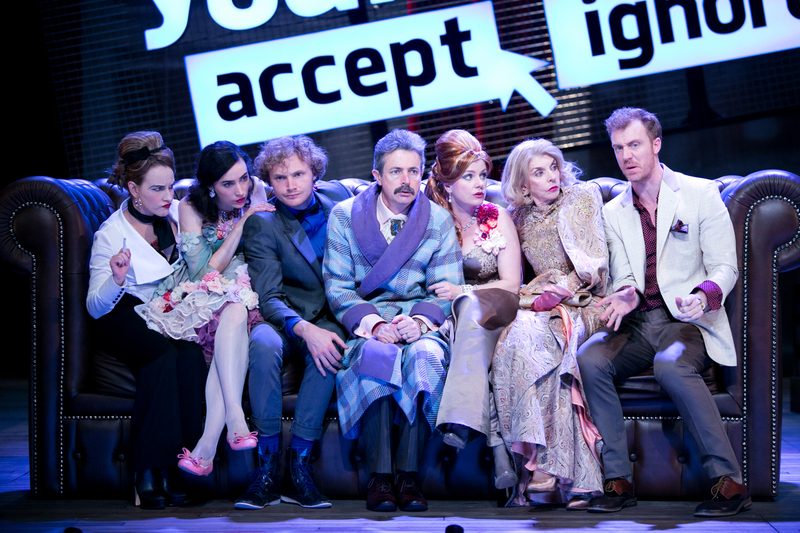 After initial laughter at seeing septuagenarians larking around, saying “fucktard” and dancing to contemporary pop songs, we accept the convention as the actors draw us into the character’s emotional dilemmas. There are lovely moments for all the characters, while Otto’s portrayal of the sad, alienated Ronny is heartbreaking. The characters can’t believe how quickly their high school years have flown. Young people will doubtless relate to that, but Seventeen will probably speak loudest to people whose teenage years are long in the past and for whom the passing of time and sense of nostalgia will strike even more of a chord. Whittet writes with love, tenderness and a gentle optimism. He doesn’t tell us what happens to the characters – which would arguably make for an even stronger play – but he leaves us hoping against hope that things will turn out well for all of them. A crumpled, somewhat slovenly figure is slumped at a dining table in a starkly furnished modern room having presumably sat up all night. Above her, a red neon sign spells out the name Elektra. Sure enough, it is the Elektra of Jada Alberts’ and Anne-Louise Sarks’ Elektra/Orestes: a contemporary adaptation of the Greek myth about a family steeped in violence in the name of revenge. Dressed in baggy track-pants and a T-shirt bearing the scrawled words “My Mum Killed My Dad”, her hair wild and uncombed, she is angry, antsy, anguished, zapping a remote control to turn blasting music on and off. The mythical tragedy survives in various versions by ancient Greek dramatists Sophocles, Euripides and Aeschylus. Elektra and her brother Orestes kill their mother Klytemnestra in revenge for her murder of their father Agamemnon with the help of her lover Aegisthus. Klytemnestra was in turn avenging the death of her eldest daughter Iphigenia, sacrificed by Agamemnon to appease the goddess Artemis in return for the winds to sail his ships to the Trojan War. He returned home with Cassandra, a war trophy who had borne him twins. 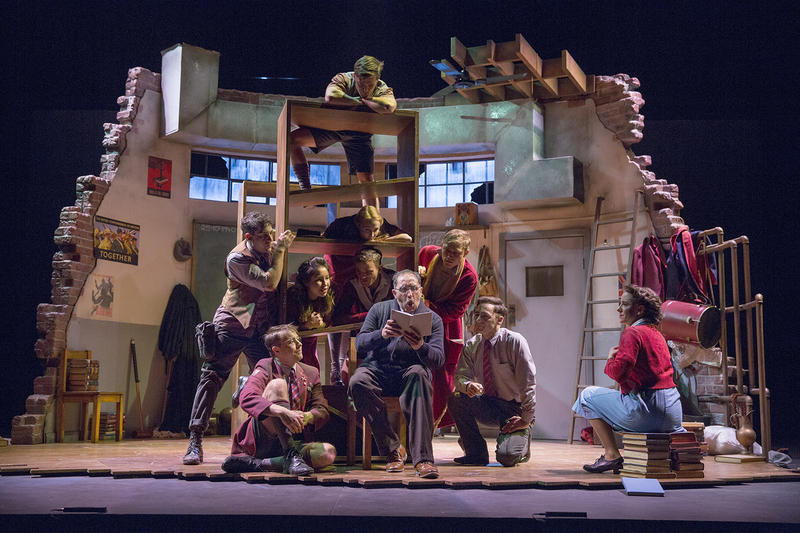 Alberts and Sarks (who also directs) give their new version a modern domestic setting, with a stage design by Ralph Myers. Running a tight one-hour, the first half takes place in the dining room on the day that Orestes finally returns after years in exile to exact Elektra’s long-planned revenge. A door leads into the kitchen, through which the characters disappear then return as events unfold. As the day begins, Elektra (Katherine Tonkin) is petulant and aggressive towards her mother (Linda Cropper), while her sister Khrysothemis (Ursula Mills) makes coffee and tries to keep the peace. Aegisthus (Ben Winspear) comes and goes, a sleazy figure in boxer shorts and untied velvety dressing gown. Then a messenger (Hunter Page-Lochard) arrives to say that Orestes is dead; but it is Orestes himself. 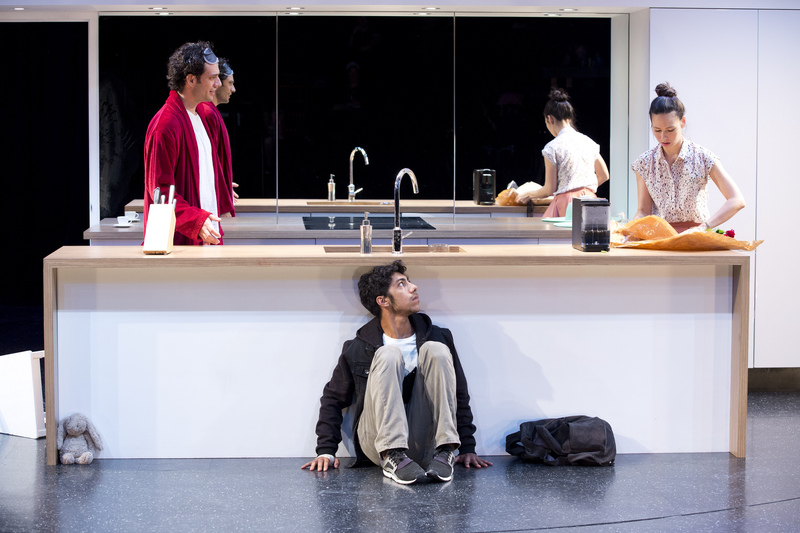 Halfway through the play, the stage turns and the action start over again, as we watch what was happening unseen in the kitchen during the first part (including Orestes’ climactic murder of Klytemnestra). It’s a clever concept that makes for an intriguing structure and gripping drama. Sarks balances the production beautifully, making sure the timings work and ensuring that we hear and glimpse just enough from the other room to trace the unfolding drama from the two perspectives. She and Alberts have also added a shocking, new twist to the family dynamic that ups the ante yet another notch. Where the Greeks kept the violence off-stage, leaving it to the imagination, Sarks puts it on stage. It’s not easy to portray violence live in the theatre and there were a few giggles on opening night but I thought they handled it well (fight direction by Scott Witt) with enough blood but not too much. The production certainly gives you pause to ponder what a body being stabbed more than 20 times (as we have read about in the news recently) actually means, and the frenzied nature of such an attack. The performances are generally excellent. Tonkin is ferociously good as Elektra, her fierce performance convincingly powered by overwhelming emotions that she can’t deal with. Instead she lashes out physically and verbally, in almost childlike fashion at times, as grief, anger and bitter resentment consume her. Cropper is also superb as the cool, chic Klytemnestra encapsulating her tough steeliness yet also the world-weariness, regret and internal conflict she is now forced to live with. The script makes her actions understandable and the final scenes in which she explains herself have a real power. 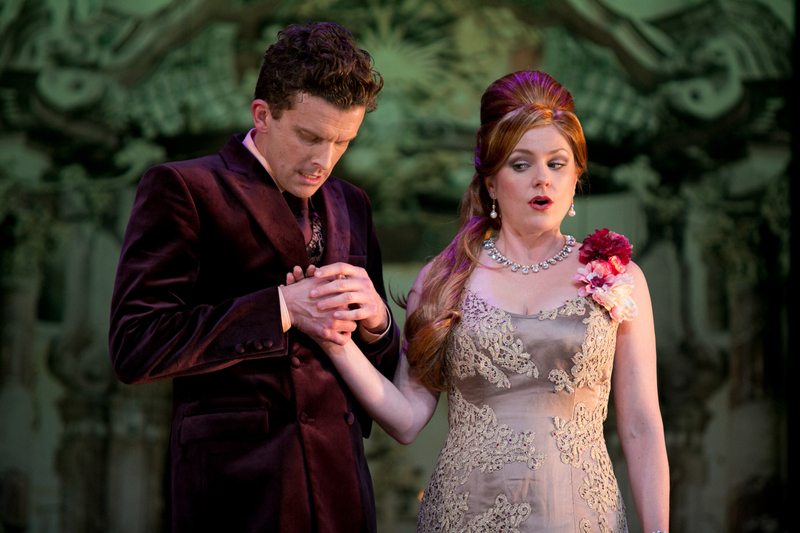 Mills and Winspear make the most of relatively small roles with vivid performances, and Page-Lochard’s portrayal grows in strength as the play progresses. Mel Page’s costuming, Damien Cooper’s lighting and Stefan Gregory’s sound all contribute to the taut, effective, stark staging. The dialogue itself is believably every-day, though certain phrases sing, and there is a surprising amount of humour predominantly as a result of Elektra’s agro. 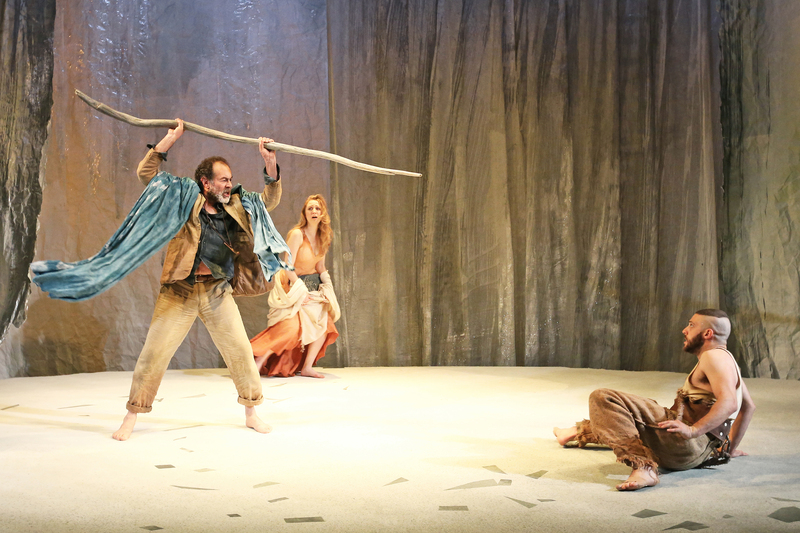 But stripped of the poetry and grandeur of ancient Greek tragedy, Elektra/Orestes makes the violence real and ugly. Elektra/Orestes doesn’t have quite the same emotional impact as Sarks’ 2012 award-winning, contemporary Medea (co-adapted with Kate Mulvany), which operated in a similar fashion, telling the story from the point of view of Medea’s murdered young sons, seen in their bedroom. 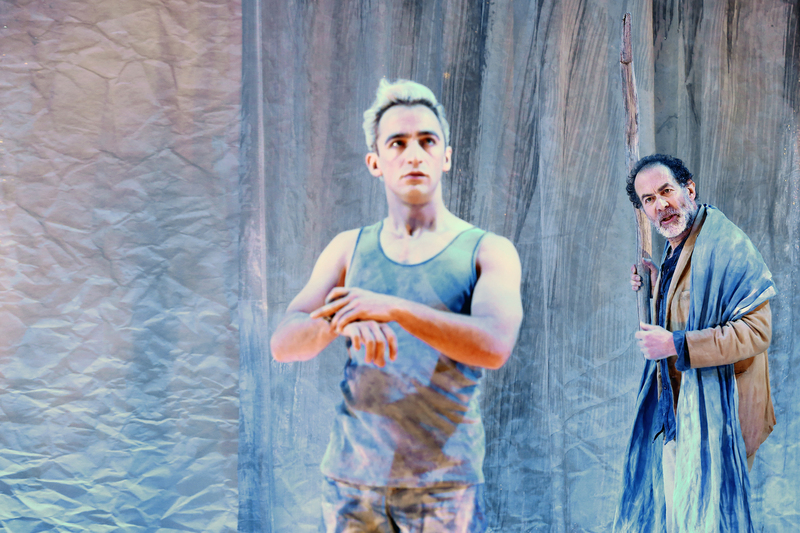 The concluding image of Orestes and Klytemnestra would be more moving if we had seen some of the conflicting emotions raging within Page-Lochard’s Orestes in the lead-up to the murder. As it is, his final reaction comes rather out of nowhere and is therefore less potent. 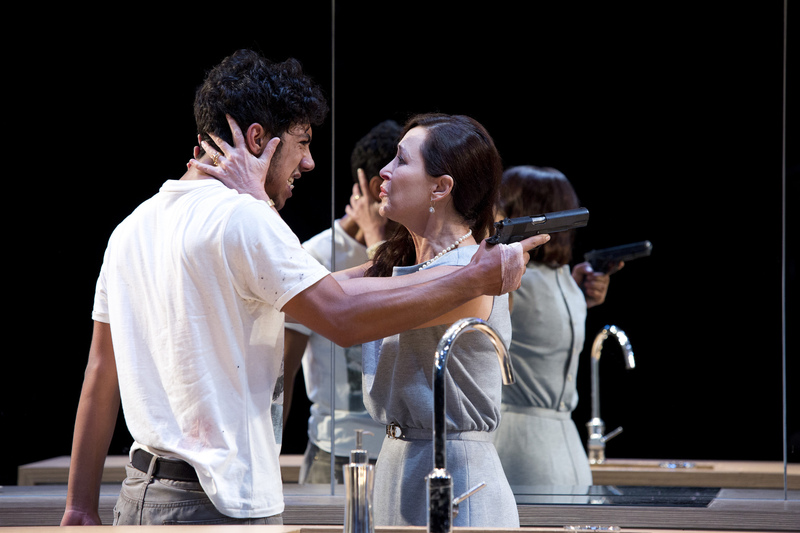 Nonetheless, Elektra/Orestes is a clever, provocative, pithy piece, showing that revenge only perpetuates cycles of violence and doesn’t assuage anger, grief and resentment (understandable though they may be). Only in forgiveness can we hope to find any peace – something we so often struggle to accept and achieve. The magic begins as soon as you enter the theatre to find the seats dusted with (paper) snow. All over the theatre young and old excitedly lark around with it, dumping it on each other’s heads and tossing snowballs. 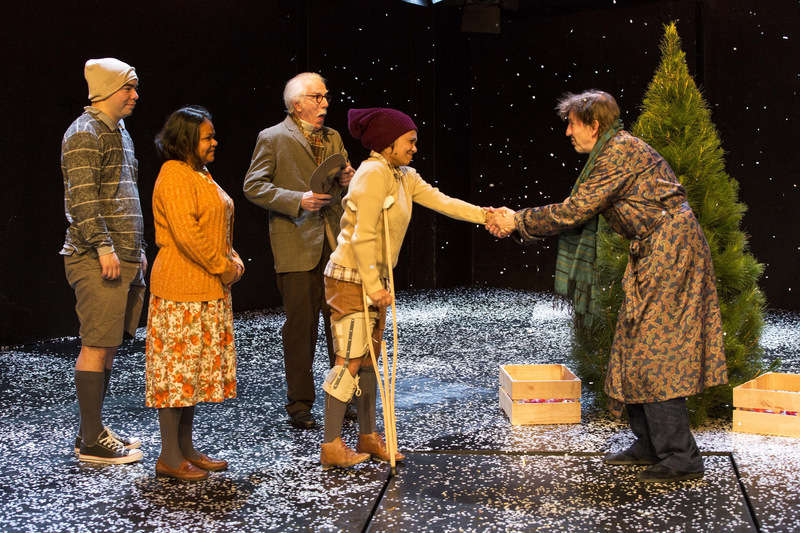 It’s the perfect start to Belvoir’s A Christmas Carol: a production so delightful and touching it would melt the hardest heart. The costuming is contemporary (Mel Page) but the adaptation by director Anne-Louise Sarks and Benedict Hardie is a faithful telling of Charles Dickens’ timeless tale. In this materialistic society of ours, the story of the miserly Scrooge resonates as powerfully as ever. Visited on Christmas Eve by the ghost of his former business partner Jacob Marley, followed by the Ghosts of Christmas Past, Present and Yet To Come, Scrooge learns to open his heart (and wallet). The messages that although you can’t change your past, it’s never too late to change your ways, and that it’s more rewarding to give than to receive, are as beautiful and timely as ever. 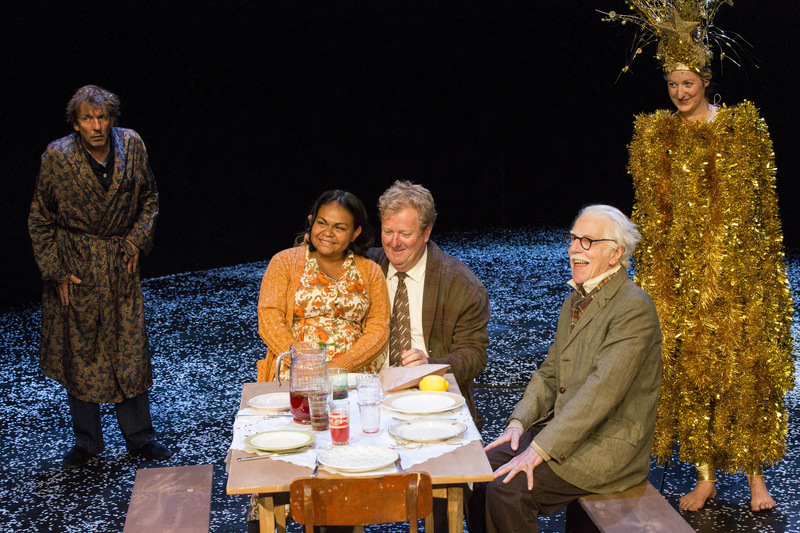 The Belvoir stage has rarely looked larger than it does with Michael Hankin’s steeply raked black set. It’s a deceptively simple design with trap doors and a platform that rises and falls, brought to vivid life by Benjamin Cisterne’s dynamic lighting. Sarks’ production doesn’t avoid the dark corners of the story but her production twinkles with joy and playfulness along with showers of snow and glitter, a human Christmas tree, and carol singers in wonderfully naff, knitted Christmas jumpers (think Mark Darcy in Bridget Jones’s Diary). Robert Menzies is perfect as the mean-spirited, grouchy Scrooge, who starts the evening growling “Bah, humbug!” to any mention of Christmas and gradually thaws until he is gamboling in the snow making angel wings. The other seven actors take on a number of roles each and work together as a tight ensemble. Steve Rodgers brings a beatific smile and deep humanity to the role of Bob Cratchitt, matched by Ursula Yovich as his kind-hearted but tougher, spirited wife. Together they are incredibly touching. 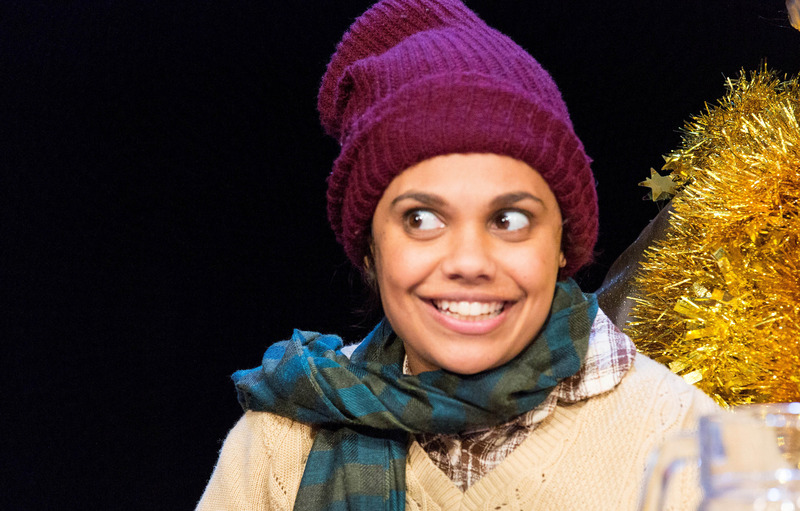 Miranda Tapsell’s radiantly glowing face could light the darkest night as Tiny Tim. Wearing a gorgeous confection-of-a-costume made from gold tinsel, Kate Box brings a deliciously mischievous exuberance to the Ghost of Christmas Present. Ivan Donato is a more solemn presence as the Ghost of Christmas Past in a shiny suit, Peter Carroll is hilariously, maniacally unhinged as Jacob Marley, while Eden Falk is decency and kindness personified as Scrooge’s nephew. 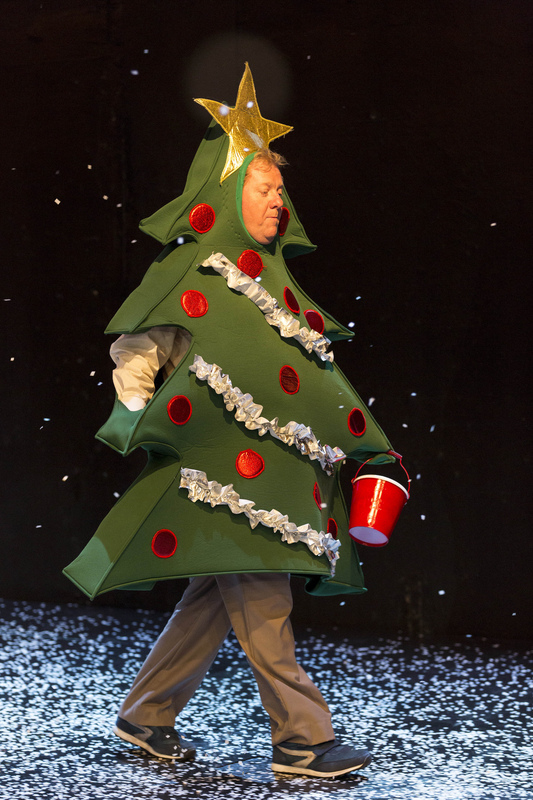 With music by Stefan Gregory and movement by Scott Witt, the heartwarming, family-friendly production (which runs 75 minutes) moves you to laughter and tears, sending you home filled with the spirit of Christmas. In fact, I felt so uplifted that the next morning I booked tickets to take my family to see it just before Christmas. A real gift of a show.